Hyperconverged secondary storage vendor Cohesity saw the number of its public sector clients increase by nearly 200 percent during its fiscal third and fourth quarters. Cohesity said Monday it added 24 new federal customers in Q4 alone and the company attributes the growth of its government customer base to agencies’ data center consolidation initiatives. 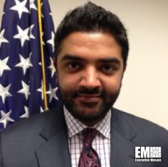 “IT modernization initiatives are prompting federal organizations to re-examine legacy approaches to protecting, storing and managing their secondary data, both on-premises and in hybrid cloud environments,” said Steve Grewal, chief technology officer of Cohesity’ federal business. Grewal added the company’s DataPlatform works to help users create value from huge amounts of data. Cohesity expanded its public sector group by almost 300 percent over the past 12 months. New clients include the Defense Information Systems Agency, U.S. Army, National Science Foundation and the departments of Agriculture, Justice and Veterans Affairs.